Insights into how droplets merge could help make 3-D printing technologies more accurate and may help improve the forecasting of thunderstorms and other weather events, the study suggests. These ripples – known as thermal-capillary waves – are too small to be detected by the naked eye or by using the most advanced experimental techniques. The team used the ARCHER UK National Supercomputing Service – operated by EPCC, the University's high-performance computing facility – to run their simulations. These used thousands of processors to model interactions between nearly five million atoms. "We now have a good understanding of how droplets combine at a molecular level. These insights, combined with existing knowledge, may enable us to better understand rain drop growth and development in thunderstorms, or improve the quality of printing technologies. The research could also aid in the design of next-generation liquid-cooling systems for new high-powered electronics," says Sreehari Perumanath, School of Engineering, University of Edinburgh. "The theoretical framework developed for the waves on nanoscale droplets enabled us to understand Edinburgh's remarkable molecular simulation data. 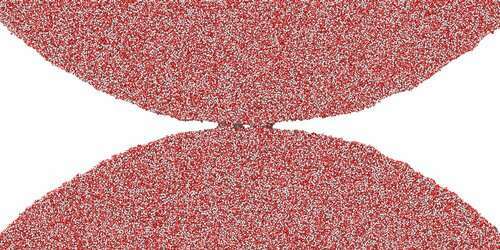 Critically, the new theory allows us to predict the behaviour of larger engineering-scale droplets, which are too big for even ARCHER to capture, and enable new experimental discoveries," says Dr. James Sprittles, Mathematics Institute, University of Warwick.